It feels weird to talk about a puzzle game in terms of its narrative achievements, but that’s why 3 in Three excels. From a gameplay standpoint, it’s roughly the digital equivalent of a big paperback Pennysaver puzzle book. There’s a grab-bag assortment of puzzles – some fiendishly enjoyable and some dully frustrating. 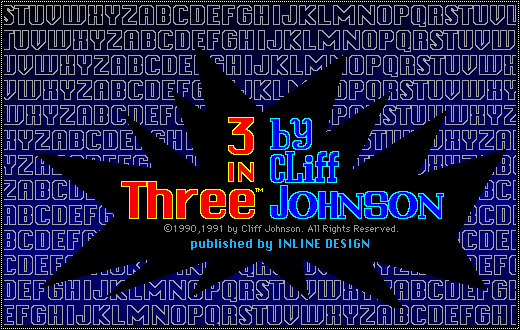 But developer Cliff Johnson made the game special by wrapping the entire thing in a quirky story about computers, data, and language. It provides a fun context for puzzle-solving and props up some of the game’s inherent limitations. 3 in Three takes place within in an office computer in non-specific “Corporate America.” You play as the number 3 who, after being deleted from a spreadsheet, ends up lost within the depths of the hardware. In order to find her way back to the document, 3 has to navigate a bizarre world ruled by language and letters. Only by solving their conundrums can she bring together the Letter Legislature and find a way back. The story is heavily tongue-in-cheek, with most of the conflict caused by the various letters and symbols that run aground from their own short-sightedness. Characters in the computer are always witty, even if they don’t make… cents! The game consists of a few dozen puzzles, each in a separate scene with some comedic framing and dialogue. 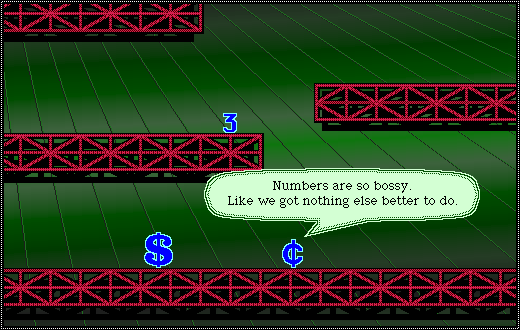 These little vignettes give the puzzles some much-needed context that augments their otherwise run-of-the-mill design. One puzzle, for example, asks you to add vowels back to famous axioms and phrases. You’re given this task after you cross a pompous letter A that wants you to acknowledge the importance of vowels; puns involving “I,” “you,” and “why,” soon follow. In another case, a numerical logic puzzle is set inside the computer’s CPU, giving some explanation to its sterility. Stereotyped character conflicts lead to some clever setups: symbols, for example, tend to be irrational and need ordering, while serif and sans-serif fonts will bicker with each other during a word challenge. It’s silly, and it’s terrific. At their best, these narrative contextualizations improve the puzzles. But they also give the world of 3 in Three personality. The computer feels like a lived-in world that you’re dropping into instead of than an environment constructed as a puzzle delivery vehicle. This is the best possible scenario for a game like this, as the puzzles become organic pieces of the setting and belie their totally arbitrary nature. The siloed structure of the puzzle scenes also allows for some interesting narrative twists. The scenes can be viewed in any order as they are unlocked, and some even need to be revisited for additional narrative information or clues to the game’s larger meta-puzzle. Again, it makes the game more coherent, intentional, and alive, all qualities that you don’t expect from a puzzle collection. Those puzzles form the backbone of the entire game, though, and many aren’t that fun. There’s great ones, to be sure, like a devilish riddle game where you add letters to words to change their meaning (making a boy happy is turning “lad” into “glad,” for instance). 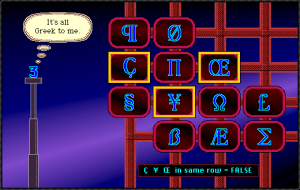 Word puzzles, not usually common in puzzle games, are a welcome recurring feature in Johnson’s games. But a surprising number of the puzzles are unfathomable guessing games that need to be brute-forced. One repeat offender is a format in which you have to open a wall of panels by hitting toggleable buttons in a particular sequence. In miniature, this is manageable, but 3 in Three scales it beyond a solvable level. One particular scene asks you to press 12 buttons to press in a specific order, leading to over 479 million possible combinations. There is no earthly way to figure this puzzle out by any logical method. It’s enormously frustrating and fails to stimulate any intellectual reaction. 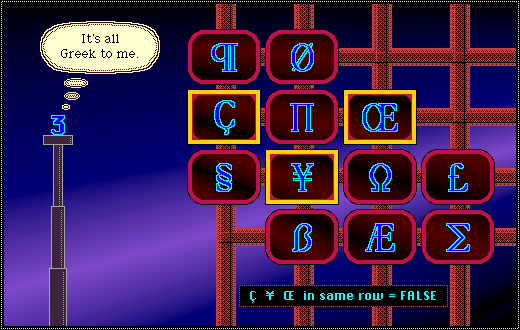 This is by far the worst of the bunch, but similar puzzles involving re-ordering sequences of letters are aggravating for the same reasons. The game’s unique narrative mortar once again proves a saving grace in these cases. It seems transgressive to use walkthroughs and hint guides to bypass the puzzles in a puzzle compilation, as that cheats you out on the bulk of the game’s substantive content. But for 3 in Three, the weird computer world and 3’s acerbic comments are entertaining enough in their own right and worth skipping through some of the worse puzzles for. I’ll admit to looking up the solution of that previously mentioned nightmare puzzle, but I really wanted to see where the story went and what sort of solutions the Letter Legislature had to offer. There are periodic glimpses (through highlighted letters and cryptic background phrases) of the end-game meta-puzzle, and it felt okay to miss out on the least enjoyable scenes to get there. 3 in Three drifts that way too, almost ready to abandon its puzzles and let the narrative context consume the entire game. But each aspect so enhances the other that they’re effectively inseparable: the puzzles give the story a purpose, and the setting makes the puzzles more interesting. Even with a handful of rotten scenes, the game still finds a compellingly silly reason to get invested, basically, in a bunch of brainteasers. Amazing game. 🙂 Really makes ya think.